In 2018, Kiara Adams was the Recreational Cheerleading coach at the Royals All Stars Cheerleading Academy and is excited to be coaching some of our Competition Cheerleading teams in 2019 . She has a background in competitive gymnastics (as well as junior gymnastics coaching) since she was 8 years old and has over 10 years of experience within the sport of competitive cheerleading. 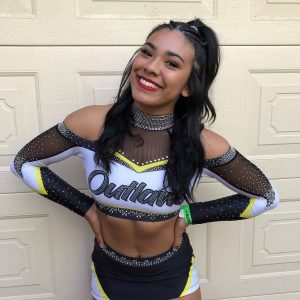 Kiara began cheerleading for her local gymnastics centre’s cheerleading team Endeavour Fusion back in 2009 and is now currently an athlete on Melbourne’s Outlaws Allstars Kelly girls IOAG5. Kiara has competed in and won many state, national and international competition titles. Kiara was a part of the first Australian cheerleading team to ever win the National Cheerleaders Association competition NCA nationals in 2016 in Dallas Texas. After receiving a bid at NCA she was then also a part of the first Australian team to compete at the ‘invite only’ competition called the Summit a few months later in Orlando Florida. Her ultimate goal for her cheerleading career is to compete at the World Cheerleading Championships which is also held in Orlando Florida. Kiara is internationally credentialed as a USASF/IASF cheerleading and tumbling coach and is also a member of the Australian All Star Cheerleading Federation. She has a deep passion for cheerleading and a love for coaching. She believes that cheerleading teaches and strengthens important life values such as team work, dedication, and perseverance. She is a driven and enthusiastic person who loves seeing students achieve goals they’ve placed for themselves/their team and seeing all their hard work pay off when achieving new skills.